Activ Vite is rich in Collagen Hydrolysate and Calcium, the vital ingredients for the formation of healthy bones and protein for maintaining muscle mass. Combined with magnesium and Vitamin C, essential for the continued maintenance of strong bones and teeth. Improves skin, hair & nail quality. No pills - an average capsule contains only 500mg, please bear this in mind when comparing products. 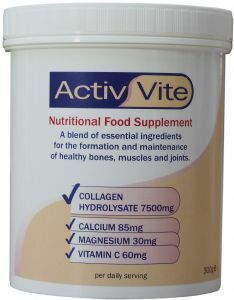 Activ Vite is rich in Collagen Hydrolysate and Calcium, the vital ingredients for the formation of healhty bones and protein for maintaining muscle mass, it also contains magnesium and Vitamin C, essential for the continued maintenance of strong bones and teeth. Bone is made up of two major ingredients: Calcium Phosphate, which gives bone its strength and Collagen, which gives bone its flexibility. The proportion of these two ingredients is maintained at a constant level to ensure that the bone structure is strong enough to support us. 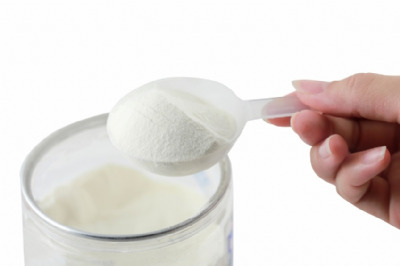 If insufficient Calcium Phosphate is present, bones degenerate and become weak. If insufficient Collagen is present, bones become brittle and break very easily. The entire process of maintaining healthy bone is subject to hormonal control. Hence, as many women reach the menopause the hormonal control of bone maintenance is disturbed and in many cases formation can no longer keep up with the breakdown of the bone, resulting in brittle bones and an increased number of fractures. Scientists and health professionals often recommend a combination of physical exercise and nutritional supplements to delay and counteract the onset of sarcopenia & Osteoporosis. Protein consumption is one of the most crucial nutritional factors for maintaining muscle mass and muscle function while aging, particularly when protein is consumed after moderate, age appropriate exercise. Directions: Mix one 10 g scoop daily with a minimum of 100 ml of water and stir until all the powder has dissolved. A scoop is included in the pack and must be kept clean and dry at all time. Recommended Usage: One scoop per day for a minimum of three months. Continuous use is recommended for prolonged benefits. Each pack contains approximately 30 days supply. Ingredients: Collagen Hydrolysate, Fructose, Tri-Calcium Phosphate, Flavouring, Magnesium Sulphate, Colour (beta carotene), Ascorbic acid. Used and ordered every month very good. I bought the powder version of collagen supplement thinking that it would be easier than taking 6 large Pills from another brand. Having a diluted version of collagen it is much easier to take daily, but the taste is awful so I have to mix it with juice. This bottle provides supplements for a month so once It finished, i didn't continue taking it because the taste put me off. In order to get the benefits of collagen you need to take it for a longer period of time.